Set up your own website and showcase your plumbing, construction or repair service in astounding style with the Plumberx Plumber and Construction WordPress theme. Choose from any of the four available professional looking home page layouts to depict your business in the best light. Further customize your header to suit your business needs by choosing from four available versions. Design the rest of your website with the simple but powerful drag and drop features of Visual Composer, and add all your preferred features to your website with no hassle. Customize it to the minutest detail by repositioning the logo, changing the background color or moving components to chosen positions on the page. Powered with Bootstrap technology, this WordPress theme automatically adapts to a range of mobile and computer screens, thus offering an amazing visual experience to customers. For your benefit, try the free demo feature to analyze and understand the powerful options available in this theme. Set it up with the one-click auto install option and gain instant access to our extensive product support documentation and customer-friendly support service. 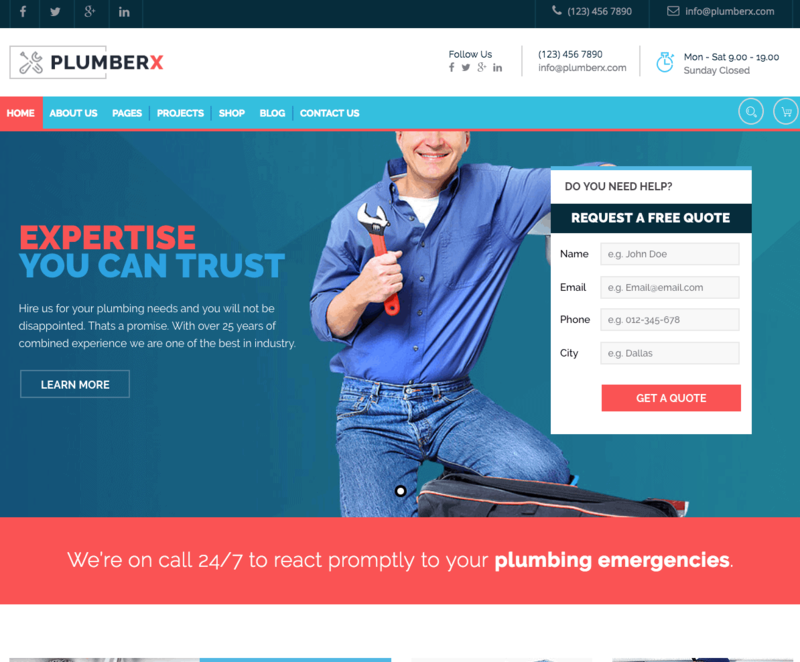 Order your Plumberx WordPress theme today and set up your plumbing, repair or construction service website like a pro.